As is traditional when I come home from any holiday destination, I went straight out and bought a few Portuguese wines as soon as I got home from Lisbon. I hold on to the belief that drinking a glass of wine from somewhere where I’ve had a fun and relaxing time will immediately make me relaxed and happy. It may not be a foolproof strategy, the wine never tastes quite the same, and I’m invariably colder than I was when I drank the wine in-country, but it always brings back fond memories. 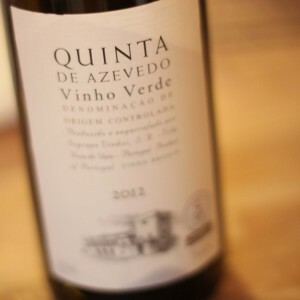 This Quinta de Azevedo Vinho Verde is reasonably priced, but everything in Lisbon seemed so unfeasibly cheap, it was about the price we’d paid for a bottle in a restaurant. It’s pale and interesting, there’s plenty to smell – it does burst out of the glass with apple and pear blossom leading the charge. It’s dry with just a little prickle of CO2 giving it a zippy feel. It’s light bodied and light in alcohol at around 11.5% – by light I mean for wine, not for driving. The fruit blossoms are joined by more fruit, some citrus zing and a bit of a fruit salad mix with a tropical tang. I really enjoyed it, although some of that may have come from a little yearning to be watching the world go by in Lisbon. As Christmas approaches and there’s lots of rich food and wine to be consumed, it’s good to add something a little lighter and fresher onto the rotation so I’ll be ordering more from Majestic.